Run your pond and stock tank deicers only when necessary with help from the Farm Innovators Thermo Cube Thermostatically Controlled Outlet. This unique station plugs into a standard 120 volt electrical outlet, and has two receptacles for use with more than one item at once. The unit measures the ambient air temperature, and powers on only when the temperature reaches 35° Fahrenheit. It turns off when the air temperature rises to approximately 45° Fahrenheit, to prevent wasting electricity. The outlet is perfect for use in pump houses or unheated rooms, and can handily power any 15 amp, 120 volt engine heater or heat lamp. The plastic housing offers a durable accessory, while the item is UL rated for your confidence and safety. 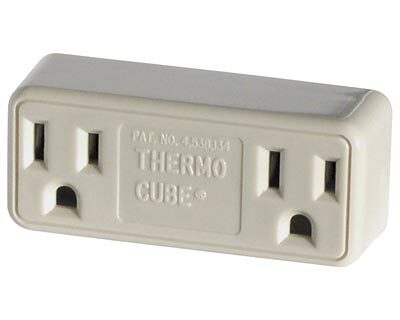 Reduce your electric bills by running your outdoor heaters or deicers only when needed with this Thermo Cube Thermostatically Controlled Outlet.